Most of Machen's fiction is short, and evokes wonder, terror, or both. His long short story "The Great God Pan" (1894), his first major success, caused a furore in London as the pagan demoness who is its central figure links horror with a prurient sexuality; a night spent with her leaves her victims grey, haunted and bound for death. Other stories around this time also explored paganism and sexuality. Most famous are "The Inmost Light" and "The White People". The latter is an eerie first-person account of a young girl's haunting by an evil statue she discovers in a wood, the fragility of her innocence creating a delicate balance between wonder and terror. Pagan horror is also central in The Three Impostors (1895) which is essentially a collection of short stories linked together in a single frame: the most often reprinted have been "The Black Seal", the story of an anthropologist who discovers a tribe of throwback hominids living in the Welsh mountains, and "The White Powder", which concerns an unfortunate young man's degeneration into primeval slime. All of these stories can be seen as examples of the fantastic genre, set identifiably in the real world, yet bound to disturb our sense of its familiar possibilities. In all the above tales, malefic powers are evoked: something ancient and terrible - demon or primeval throwback - surfaces into the modern world. Like many tales of horror, these are moralistic; the reader is often encouraged to enjoy the rise of atavistic powers which punish those who have sinned. Machen had his first successes with this kind of work, which is still popular today; however, for many readers nowadays his finest fiction was written in the later 1890s. By this time his moralistic attitudes had become more liberal, and he was more prepared to explore paganism and 'damnation' from within, and even perhaps to allow that these same dark, pagan powers might have a regenerative possibility. Pre-eminent among these slightly later works is the novel The Hill of Dreams (1907), which charts the gradual possession of a young writer by a kind of pagan faun-creature who lives within him, rather as Stevenson's Hyde lives within Jekyll. This novel, often considered Machen's finest work, powerfully evokes both a dreamlike Roman past and a dark, hallucinatory modern London, irreconcilable alternate realities between which the young writer is destroyed. 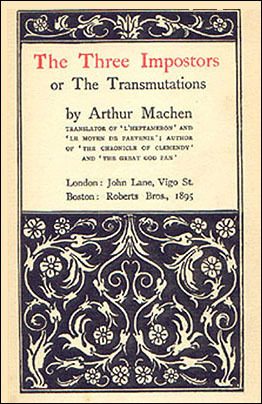 A series of very short pieces written at the same time, eventually collected under the title Ornaments in Jade, similarly shows a more ambiguously positive celebration of pagan sexual powers, and also demonstrates Machen's interest in the avant-garde prose poetry of the French decadence. Around the end of the 1890s Machen began to be interested in the healing potential of a more orthodox mysticism. His novella "A Fragment of Life" chronicles the life of Edward Darnell, who begins the tale as a suburb-dwelling clerk but makes an inward and outward journey towards mysticism and the land of his birth, Wales. Of all Machen's works this is the most successful in imagining mystical rebirth in the context of the real world. A later novel The Secret Glory(1922) explores in similar vein the life of a schoolboy who embraces the grail-quest, to find ecstasy and martyrdom. The enigmatically titled "N", which Machen wrote when he was over seventy, is a kind of psychedelic fable which concerns the discovery of an alternate reality existing in the context of a humble, grey north London suburb. Machen's greatest power is thus, to bring together banal familiarity and impossible strangeness, to the enhancement of both. Whether through the imagery of dark paganism or of mystical regeneration, Machen's fiction is consistent in its exploration of what he called ecstasy, a topic he explored fully in Hieroglyphics (1902) his work of literary theory. Though much of his non-fiction work is of polemical intent, and perhaps of lesser interest to readers today, his first volume of autobiography, Far Off Things (1922), has been widely celebrated for its mood of sustained reverie and its power to evoke a sense of wonder from landscape. Machen's temperament was intensely set against the materialism which he saw as the disease of his age; all of his works, both fiction and non-fiction, can be seen as polemic against the twin oppressions of business and science, and their secular visions of the world. All the items below are books, listed in the order of their first publication. This is in no sense a complete or scholarly bibliography: simply a guide to some landmark publications. Not all are available as current publications. 1884 The Anatomy of Tobacco, London: George Redway. Machen's first published book is neither fiction nor non-fiction, but a paean to then-fashionable tobacco and pipe-smoking, written in 'fantastickal' seventeenth century English. It is simultaneously a parody of scholastic philosophy. One of the most bizarre books ever written, and not much reprinted. 1888	The Chronicle of Clemendy, London: Carbonnek. A frame-tale in the manner of Chaucer's Canterbury Tales, written like so much of Machen's very early work in seventeenth century English. There are moments when the framed tales strike notes of dark obsession, but the collection as a whole does not have the power of Machen's work of the next decade. Not easy to find. 1894 The Great God Pan, London: John Lane. The volume contained two long short stories, the title story and "The Inmost Light". Both concern the doings of evil scientists and women who become monsters at their hands, and they shed an interesting light on current debates concerning fin de siecle misogyny and evolutionary degeneration. The former story made a great impression at the time, but some more recent readers have preferred the less manic desolation of the latter. Here you will witness the most lurid and spectacular side of Machen's talent. Both stories have been much anthologized and recently reprinted. The master-tale of occult vengeance incorporates several equally racy and fantastic framed tales, of degenerate races of pagan beings who may be controlled by occult power, and of chemicals which induce the eroticized trance-state of the ancient Witches' Sabbath. The most inventive, some would say manic, of all Machen's major narratives. Machen's one full-length statement of his writer's creed, of especial interest to those who may be today involved with the literary theory of those days. Machen defines the capacity to produce ecstasy in the reader as the touchstone of all great writing. 1906	The House of Souls, London: Grant Richards. Some of Machen's best short pieces of the 1890s were first published in magazines. Many of these appeared here in book form for the first time. The most important are "A Fragment of Life" and "The White People", both of which have been claimed by some as his finest work. Much reprinted, and most of the tales found their way into later anthologies. 1907 The Hill of Dreams, London: Grant Richards. For many readers today this is Machen's most important and moving work. Lucian Taylor, the hero, is damned, either through contact with an erotically pagan 'other' world or through something degenerate in his own nature, which he thinks of as a 'faun'. He becomes a writer, and when he moves to London he becomes trapped by the increasing reality of the dark imaginings of this creature within him, which become increasingly real. Machen drew copiously on his own early years in Wales and London, and the book as a whole is an exploration through imagination of a potential fate which he personally avoided. One of the first explorations in fiction of the figure of the doomed artist, who is biographically so much a part of the decadent 1890s. 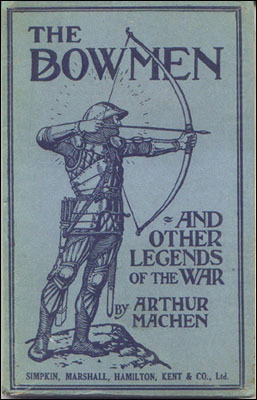 Has been reprinted as paperback, and appeared in more recent collections of Machen's work. .
1915 The Bowmen and Other Legends of the War, London: Simpkin, Marshall, Hamilton, Kent & Co.
Supertitled "The Angels of Mons". The title story is of historical significance, having given rise to the eponymous legend. Though the other stories also bear strong witness to the spiritual yearnings that prevailed in wartime, they are not Machen at his writing best..
1922	The Secret Glory, London: Martin Secker. A novel of schoolboy rebellion and the quest of the holy grail. Ambrose, the young hero, survives his appallingly materialistic and sadistic public school to become a mystic in the Celtic tradition of his forefathers. A book much beloved of John Betjeman. 1922	Far Off Things, London: Martin Secker. The first and most lyrical section of Machen's autobiographical memoir, especially beloved of those who celebrate the author as a major stylist of evocative prose. The sublime Welsh landscapes shape the childhood of the author in approved Wordsworthian fashion. 1924	The London Adventure, London: Martin Secker. Machen's final burst of autobiography abandons progressively its attempt to tell a story and becomes instead concerned with its own genesis, and with the strangeness of the universe we inhabit. Machen at his most ludic. 1933	The Green Round, London: Ernest Benn. Machen's final full-length work of fiction is judged a failure by some. However, in this work, Machen's earlier exploration of the fantastic moves outward to embrace the absurd, of Kafka, Camus and Sartre. Not recommended for devotees of gothic and horror, but of potential fascination for the rest of us. 1946	Holy Terrors, London: Penguin. Some of Machen's most daringly aesthetic pieces from the 1890s as well as some more conventional fiction from the time of the First World War found their way into this selection, which was published just before Machen's death in 1947. 1949	Tales of Horror and the Supernatural, London: The Richards Press. This hasn't quite the comprehensiveness the title implies, but is a very good collection of what has a wide consensus as Machen's best. Includes The Hill of Dreams, "A Fragment of Life", Far Off Things, "N"
A collection of Machen's fiction pieces published hitherto only in magazine format. Includes "A Double Return" which was highly praised by Oscar Wilde, and several of Machen's fine but neglected late tales. A selection of Machen's most interesting essays and articles on non-fiction topics, none hitherto published in book form.